"My work is coming steadily along...I thrive in the repetitive routine." "Artists who wish to set the light free; which is what I also wish to do, to make it visible for its own sake." This photograph of Anne Truitt in front of one of her sculptures came from this fantastic Brain Picking's article: Anne Truitt on Resisting the Label “Artist” and the Difference Between Doing Art and Being an Artist. "But the essential struggle is private and bears no relation to anyone else's. It is of necessity a solitary and lonely endeavor to explore one's own sensibility, to discover how it works and to implement honestly its manifestations. It is ultimately character that underwrites art. The quality of art can only reflect the quality and range of a person's sensitivity, intellect, perception, and experience." "The sun interpenetrates the earth; they have business with each other. Air and I are somewhere in between." 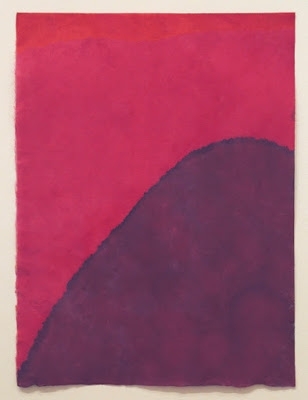 Anne Truitt's Landfall, 1970, in Matthew Marks Gallery, picture from dayoutlast blog. Anne Truitt describes beautifully in her Daybook how this sculpture came to her, shamefully too long to place here. somehow stained into my body as color into cloth." Truitt's work is now at the National Gallery of Art in Washington DC. "In the Tower" is up until April 1st, 2018.